Let’s start here: breathtaking. No hyperbole. This collaboration between singer/songwriter Michelle Cross and sound artist Joe Frawley is the most interesting and emotionally powerful half-hour of music I’ve heard in quite awhile. Dolls Come to Life comes at you wielding two very effective weapons. The first is Cross’ voice, a gripping hybrid of a Kate Bush range, complete with quirky arcs and angles, and the turn-in-a-heartbeat duality of Tori Amos, that ability to flick the switch from wide-eyed, verge-of-tears vulnerability to a sharply worded, visceral threat. The story she tells through her lyrics is a raw wound we’re invited to look into and poke at. “No more dollies for you at Christmas,” she says at the start of “No More Dollies,” and it’s genuinely sad. Later in the track she drops firmly into Amos’ territory in both sound and lyric: “And how I hate the pretty girls/they all think they’re so popular/And how they shame an ugly girl/and so, I sacrifice myself.” At a break in the title track she asks, “How many times should I believe you?” and we have to ask ourselves what lies she’s been told. For pure heart-rending truth and sadness, there is her re-work of “My Favorite Things.” It’s sparse at first, with Cross’ words spilling out with the weary ennui of a disenchanted chanteuse. The revisited lines–“Valentine and roses and whispered confessions/Unwritten poems and soft-hearted villains”–make for a nice disjoint between what we know and where we’re going. There’s a beautiful drop and then the piece takes off. When Cross reaches, “And then I don’t feel so sad,” the piece takes a turn and blossoms into something striving toward hope. Layered vocals and big, rich piano reach upward, peaking with “Finally seeing a bad day come to an end.” Suddenly, we find ourselves back in simple sadness, and it arrives like a punch. Toward the end, when she all but whispers “When the phone rings/and it’s not him,” it feels like she’s naked and face-down on the floor, one hand stretched toward a door that isn’t going to open, and that should be about it for your heart. On the other side is Frawley, taking snippets from Cross and rendering them down with surgical precision into atmospheric elements. Frawley’s specialty is capturing in sound the rapid, jump-cut way our minds work. Moments flash past, things come up half-formed and changing, pain flashes past in an instant, still leaving a mark. Frawley sets that up, creating someone else’s memories and moments, then grabs us by the hand and runs us through it. Callback is a large part of the potency. We re-hear things we recognize, stuffed into different moments, and we’re freshly reminded of how they made us feel. 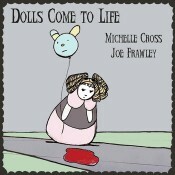 He repeats a line from “Dolls Come To Life”–don’t lose the way–over and over. It keeps the theme of the thing together and makes us revisit the emotional core of the story. As always, too, he takes tiny moments of our natural sounds, like breaths between words, uhhs and wavering notes from songs, and uses them to heighten the overall intimacy. There’s a lot of atmospheric work here. Listen to the young girl’s voice counting off waltz steps in the title track, or the kids singing “Ashes, ashes” in the background. Static crackles, snips of conversation ghost past, a radio spits out Morse code. “Wish Thing” is a scattershot burst of elements reworked into fresh patterns. Low piano notes mimic restructured utterances from Cross, like a song that can’t quite find itself. I can’t stop listening to this work. Between the pure impact of Cross’ voice and Frawley’s vivid sound-pictures, between the straightforward beauty of the songs and the constantly shifting thoughtscapes, Dolls Come to Life just hits over and over. It’s hard to believe, sometimes, that it’s only half an hour. A little weird, a lot of wonderful. Please discover this disc for yourself. Enjoying this immensely, very different.